To be fond of dancing was a certain step towards falling in love” — Jane Austen, Pride and Prejudice. 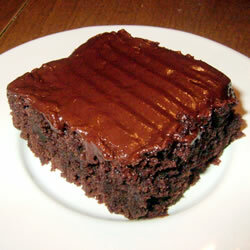 Original Recipe Yield 16 brownies — This recipe has over 5,000 rave reviews on Allrecipes. To Make Frosting: Combine 3 tablespoons butter, 3 tablespoons cocoa, 1 tablespoon honey, 1 teaspoon vanilla, and 1 cup confectioners’ sugar. Frost brownies while they are still warm.